For anyone looking for extra peace of mind at home, you could do worse than install a home security camera system. It's not a cheap endeavor by any means, but if you can afford to do it, there are genuine benefits to be had. Netgear's range of Arlo Pro cameras are among the best in the business, and right now it's possible to pick up its second-generation hardware at a tidy price. 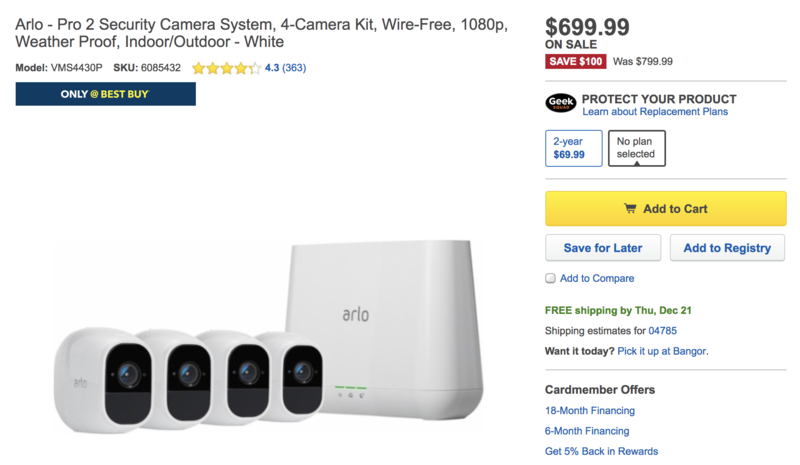 The Arlo Pro 2 system is made up of a base station with a built-in siren, plus any number of cameras linked up to it. You can play it simple and have cameras pointing at your front and rear doors, or you could go full Fort Knox and fill your house with them. At that point, the system itself might be the thing most worth stealing, though. These deals represent pretty good savings for a system that's still quite new. There are some caveats, however. In our personal experience with the Arlo Pro 2, we've found that there have been some connectivity problems. Other reviews tend to back this up, but there are also plenty of happy customers who report no issues at all. We suggest you do your own research on this one, too, and if in doubt, it might be better going for the first generation model instead. Perhaps the first run of the Pro 2 produced some faulty units, although that may well have been rectified by now. To get our take on the best smart home devices you can buy right now, check out our Most Wanted holiday gift guide.